I have just completed a Beautiful new edition of my Zinnia. 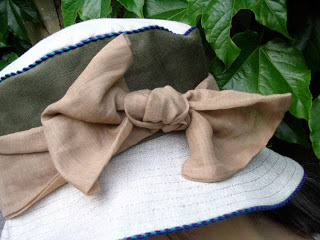 With a stylish modern romantic look, this 100% linen hat offers terrific shelter from the suns rays. 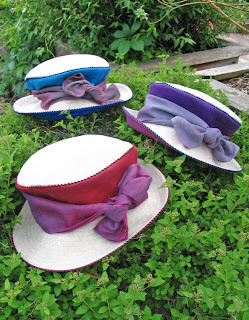 The natural colored linen on the top and upper brim of each hat reflects the heat, while the under side of the rim and the band bring a fun splash of summer colors to the face. The trims I use in this design provide a crisp yet delicate finish. The shot 2 colour light weight cotton scarf offers a softening flourish. 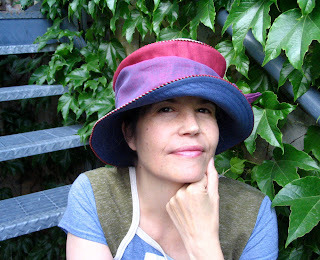 It can also be tightened when the wind picks up, to keep your hat on top. If you have long hair, this shape will also allow you to tuck your hair up inside and keep the back of your neck cool. I am blessed to have our business in one of Toronto’s most inspiring creative buildings. This community of like-minded souls filled with new ideas and the spirit of creation has helped me to blossom into the person I am today. One of the magical features of 401 Richmond St. West is it’s amazing roof garden. This calming environment has allowed me to reflect on my designs and take refuge from the fast pace of daily life in the city. 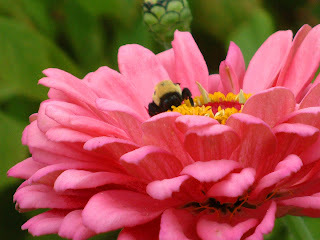 My Zinnia design got its name when I fell in love with the Giant Zinnias on the roof garden at 401. This beautiful flower has become one of my favorites during the hot summer months. They come in many colours and thrive in the sunny weather when temperatures soar. The roof garden is also a testing ground for new summer products or in this case a photo to show how my colors dance with the greenery! Tucked away in the heart of our city, this hidden gem, was featured as an official green site in the 8th annual Doors Open Toronto. Many visitors were eager to experience both the garden and our work that weekend. Fortunately our atelier looks right out onto this wonderful oasis and inspires us everyday. With a community of creative thinkers at the helm and a community of birds, bees and butterflies on the deck, 401 Richmond is like a modern day Noah’s ark, protecting the creative spirit and moving towards a more sustainable future. It gives me great satisfaction to know that when you shop at Gwendolyne Hats all the abundance surrounding our atelier is part of your purchase. Many of the materials and techniques I use in my work are disappearing. 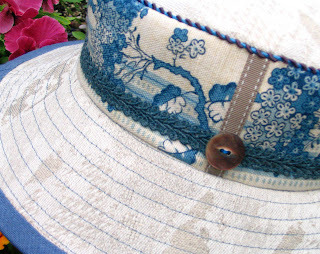 For example "toile de jouy" a printed linen fabric used on the band of this hat. I recently started a silkscreen course to remedy this dilemma. Not only will I be adding another skill to my repertoire, I hope to inspire some new directions in my designs. My course is on the ground floor of 401 Richmond, in Studio 109 at The Contemporary Textile Studio Co-operative. A wonderful new addition. John Ruskin (1819 - 1900) English art critic. Gwendolyne Hats established in 1991 is a unique and creative accessory business located in Toronto, Canada. 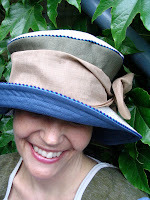 Specializing in hand cut one of kind hats Gwendolyne Preboy is a true believer in quality and lasting beauty. To find out more visit the website. Follow Gwendolyne's board GwensButton Shop on Pinterest.